Reviewed by: Robert Yaniz Jr.
Those who are curious about what Ratchet & Clank has to offer are better off picking up a controller and experiencing the adventure for themselves. It's certainly going to yield a better time than this forgettable misfire. To proclaim that film adaptations of video games have a spotty history of box office success would be an understatement. In fact, the only such effort to inspire more than a single big-screen sequel has been Resident Evil, and most attempts to achieve similar success have resulted in epic disasters like Super Mario Bros., Wing Commander and Bloodrayne over the years. So, it’s worth noting that Ratchet & Clank – the first feature-length film based on the massively successful video game series – had the odds stacked against it from the start. Whereas some video game films (like the aforementioned Mario adventure) are misguided enough to disregard the mythology that fans have grown to love, the narrative of Ratchet & Clank remains remarkably true to the 2002 game that launched the franchise as well as the revamped PlayStation 4 version that recently hit shelves. The story chronicles the origin story of the titular heroes (voiced by James Arnold Taylor and the games’ David Kaye, respectively), as they are swept up in a mission to prevent the evil Chairman Drek from destroying the galaxy. Delving into the plot much more than that superficial description would be a fruitless effort because, chances are, the cliché-ridden narrative of Ratchet & Clank will offer little surprise for audiences anyway. While Ratchet & Clank wisely hews close to the source material, it’s hard to ignore that many of the film’s elements are directly lifted from the Star Wars saga. A secret weapon capable of destroying planets? Check. An ambitious hero stranded on a desert planet? Check again. The film also features an extended action sequence that recalls the podracing scene from The Phantom Menace, and it even makes copious use of the transitional wipes that are a visual touchstone for the saga. At best, the team behind Ratchet & Clank may have hoped the film would serve as a more tongue-in-cheek riff on George Lucas’s space opera, but regardless, the rampant hijacking of Star Wars iconography just seems like lazy storytelling. When you literally have a robot reciting odds to a seemingly reckless hero, perhaps your film could use a bit more polishing before it is unleashed upon the world. 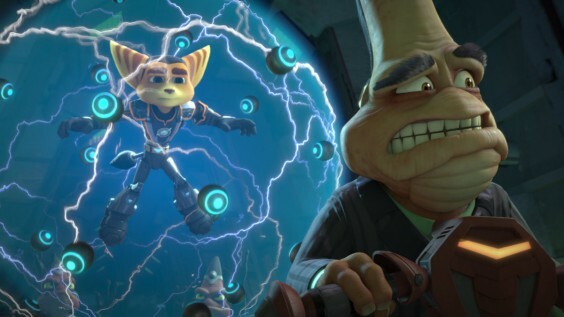 So if the sci-fi tale at the center of Ratchet & Clank doesn’t deliver something fresh, moviegoers might at least hope that the film has enough laughs to provide 94 minutes of worthwhile distraction from their everyday woes. On that front too though the film falters. Although it clearly aims to apply the self-aware tone of Megamind to the sweeping intergalactic crises that groups like DC Comics’ Green Lantern Corps. might encounter, Ratchet & Clank makes the classic mistake of confusing manic energy for imagination. Gifted performers like Paul Giamatti, Rosario Dawson, Sylvester Stallone and John Goodman (who delivered a haunting turn earlier this year in the far superior 10 Cloverfield Lane) are forced to contend with lowest-common-denominator slapstick and gags about texting and social media that feel like they were cooked up by studio executives desperate to connect with today’s youth. In fact, the humor in Ratchet & Clank is symptomatic of the widespread pandering that most animated films nowadays rely on to rein in easily satisfied children and their acquiescing parents. Despite the acclaimed work released by animation studios like Pixar, Studio Ghibli and Laika in recent years, films like this perpetuate the needless and reductive stigma that animated movies are simply kids’ fare. They are the very reason why a clever, well-crafted mainstream release like Zootopia still comes across like a breath of fresh air to critics and moviegoers alike. Ratchet & Clank does have vague traces of the respectable film it could have been with some more work, but as it stands, it really only has one or two mild chuckles to offer moviegoers, including a choice blink-and-you’ll-miss it gag centering on its use of the ubiquitous Wilhelm scream. Ratchet & Clank will likely still appeal to young children and fans of the critically acclaimed games who are willing to substantially lower their expectations. However, for most moviegoers, this film adaptation will leave much to be desired. Its animation style is only a touch better than the cut-scenes in recent installments of the video game series, including the new PS4 version, and the tired script does little to justify the decision to make the leap to another medium.